...especially when you have to run 60 miles tomorrow. But so it goes. The weather was much kinder today, & the course alternated between beautiful paths by lovely fields, and deathly spells of running facing huge trucks & buses without any shoulder. Diana ran some pieces with me, which helped raise my flagging spirits. 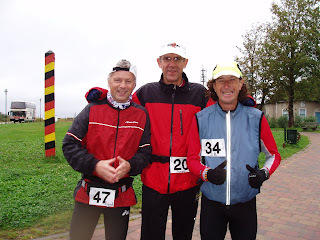 It took just over 10 hours, & thanks to a railroad crossing near the finish, I managed to finish with J-B (again) & my Norwegian friend Trond. 11th again overall, I think. Now I'm astonishly tired - another 4am wake-up tomorrow. Looking forward to some shorter stages soon! Bravo Russ! We're cheering you on from the east side of Austin. Hey Russ! Kelly here. Hey I thought of you on Sunday running. Derick (my boyfriend) and I were on Town Lake Tr. and it was HOT (we went @ 1:15 pm, chose pancakes over an early run) and I said, "If this seems hard, just think of Russell Secker. He is probably doing 50 miles today, we are only doing 12." :) Keep it up! Hope you are well. Yes 55 miles is a long way to run and you did it! Yay! There are a lot of people cheering you on at Hoover's. This really doesn't sound like you at all...there have been no reports from beer garten's, no reports of ale's be they pale or not. What gives? You're taking this entirely too seriously! Carry on my friend, you're doing a splendid job. Hey Coach! I'm astonished at both your fitness and mental toughness. It's utterly inspiring to follow your journey. Rock on!